Jeff has been an integral part of the Auburn swimming community for over 20 years. Before returning to Auburn Aquatics as a Head Coach, he was a swimmer on Auburn university swim team from 1990 to 1992 and an assistant coach for Auburn Aquatics under Tom Healy from 1993 to 1997. In 1997 Jeff became the Head Coach of the Columbus Hurricanes. 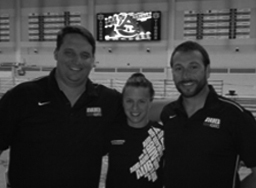 Throughout his career Jeff has had the opportunity to work with NCAA champions, Olympic Champions and World champions as well as Age group swimmers and Junior and Senior National qualifiers. All the while he has maintained a close working relationship with the Auburn University Staff. Jeff has elevated Auburn Aquatics to a Bronze Medal Club with more than 150 swimmers.